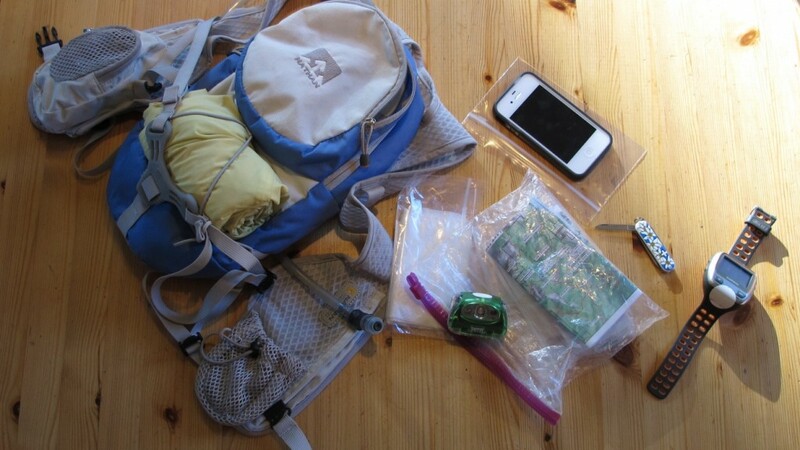 What to take with you on a trail run. Your trail running pack should include everything you need for your run plus some things that hopefully you won’t need. 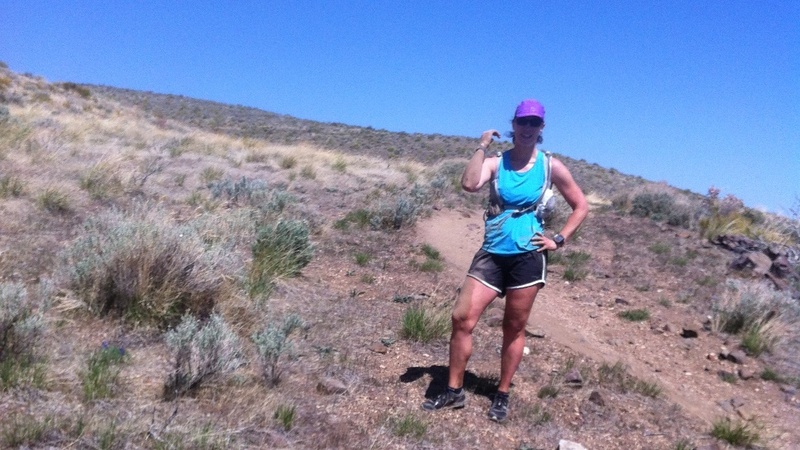 When I started trail running, I searched the Internet for advice on what to take. I couldn’t find a list specific to trail running, but I found some hiking advice that got me started. My current list strikes a balance between practicality for running and emergency safety. I have thought about what it might be like to be injured on the trail or get lost enough to unexpectedly spend an evening or even all night in the forest. I carry a couple of basic emergency items such as a headlamp, knife, and a windbreaker – all very miniature. It’s tempting to ditch the windbreaker on a beautiful Tahoe day, but I know that the most beautiful day in the mountains generally ends up with a pretty cold night. Plastic baggies are wildly useful – to protect your stuff against not only rain, but also sweat, accidental spills, and oozing gel. The snack-size zip bags are my favorite. They are useful for: use as a running wallet, cell phone protection, gel packets (full and sticky empties), and map protection. Put everything that you don’t plan on using (i.e. your emergency items) in a quart-size zip bag. This will keep them organized and dry. I use a Nathan hydration vest, so I like to consider which items I’ll need accessible during the run and put the rest in the back. I can carry everything I need for a 4-5 hour run, including water, depending on the heat. Five hours is about the longest unsupported run that I’ve done, so that is the limit of my experience here. I do omit some items when I head out on shorter trail runs where I’m very familiar with the route. Sure glad I had wet wipes and bandaids in my pack this day! I keep a morning checklist alongside my packing list. I use this mainly on race day – it’s pretty easy to forget your sunglasses at O’Dark-Thirty on race morning. Also consider loading up the car with these post-run necessities. You’ll especially need these if you have a car shuttle or longer drive home. If you are doing a car shuttle, don’t forget to put these items in the shuttle vehicle that will be at the end of your run. If you have a GPS watch, learn how to use it. Many can give you a wealth of information beyond pace and distance, including compass direction and even arrows pointing you back to your starting point. Ditto for your smart phone. If you carry an iPhone, get this great app called GPS Kit and learn how to use it. The app allows you to pre-load terrain so that you can access map data even when you are out of signal range. Just be careful not to rely solely on devices that can run out of battery. Always carry printed maps if you are not completely familiar with your route. I hope this article helps you start a trail run packing list of your own. What do you carry that’s not on my list? Or is my list way overkill for your tastes? Please leave a reply below! For a trail run race 7k what do i need to carry and what would i dress with on 30 degrees.? I recommend you go light – you don’t need hydration or fuel during a 7k. For clothes: think light layers. At 30 degrees, you probably want tights and a long sleeve shirt. A light wind breaker on top should do the trick. A light beanie and gloves are good. Consider a neck warmer – you can cover you mouth with it if you need to. All that being said, keep your hands warm and you’ll be fine! Also, be sure to have warm, dry clothes for the start & finish. Good luck & have fun! Thank you for your reply, do u recommend a brand and type of long sleeve?